Lots of people are moving this week but the trash hasn’t been particularly noteworthy or exciting. Still, I went out this morning and biked towards Olympic Stadium. 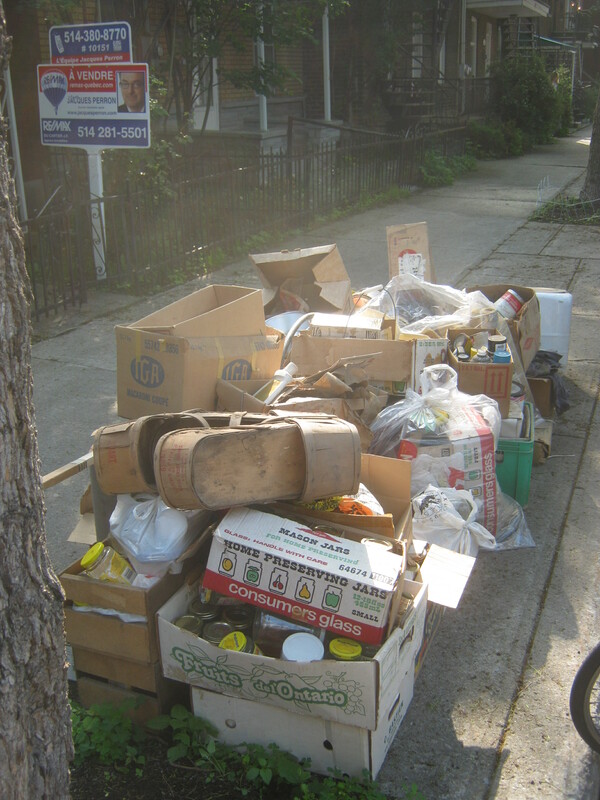 On the way back I went through Hochelaga-Maisonneuve to get to Centre-Sud, where I came across this pile of stuff in front of a house for sale. The things here looked as if they had been in a basement for a while. There were old preserves, mason jars that some passers-by ended up taking, and some old records. I thought about taking some preserves but decided against it. The records looked to be mostly classic rock – I saw a few by Boston and some Pink Floyd, but unfortunately they smelled sort of musty and as far as I know records don’t fair well against that sort of thing. I did take a few things though. 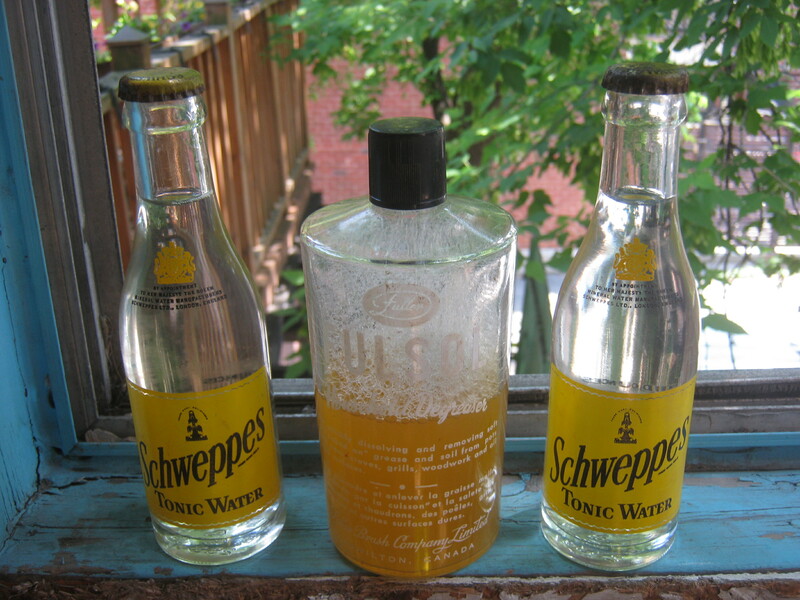 There were two unopened glass bottles of old Schweppes Tonic Water which I’d guess would be from the 60s. They’re from the time when they printed the labels directly on the bottle (whenever that was, but it was a while back). Other than a bit of rust on the caps they look great! They haven’t even really evaporated. There was also an old bottle of Fuller’s degreaser. I still have a couple of bottles of “Vintage Sprite” so these will join the collection. I’ll probably put them in my next yard sale barring their having a lot of collector’s value. 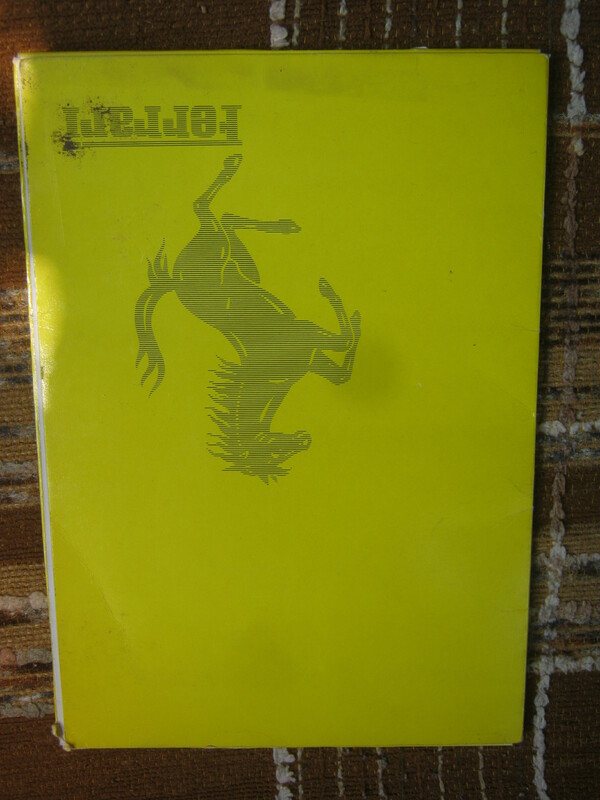 In with the records was this folder made for the Ferrari car company. A little musty but in good shape overall. 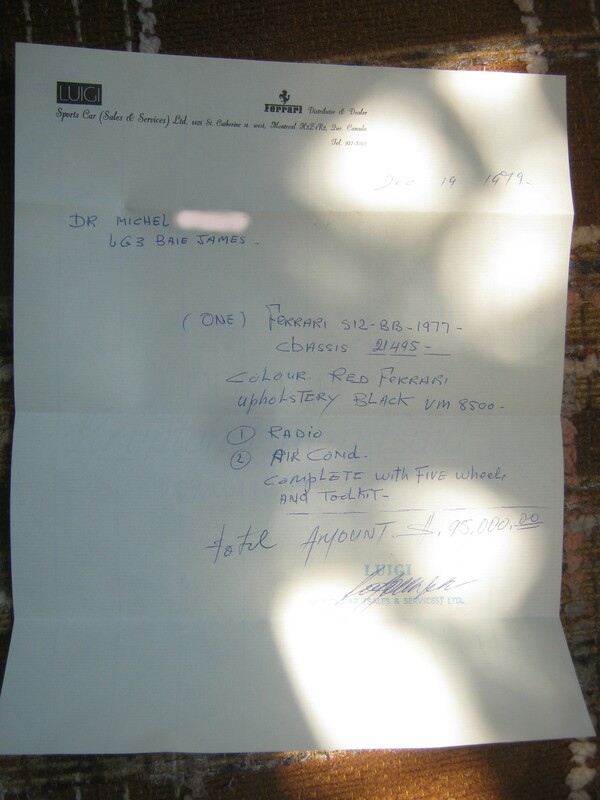 Inside the pocket was a picture of a car and an unopened envelope addressed to a doctor. 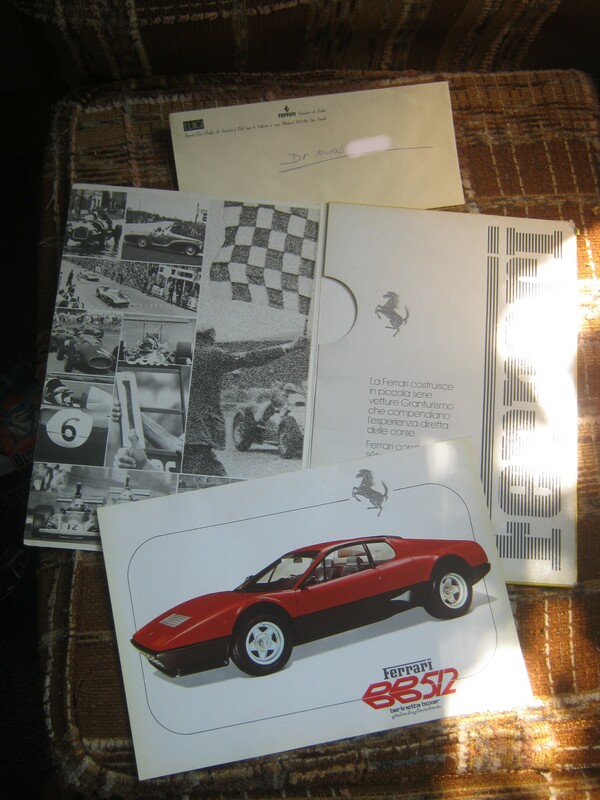 The letter inside was a receipt for a Ferrari purchased in 1979. It cost the good doctor 95000$, which in today’s money equals 296,603.05. Ah, the decadent joys of being in the upper class. By possessing this receipt I’m the closest I’ll ever be to owning a Ferrari. Still, if anyone deserves a sports car it’d be a doctor. Besides, if I spent a lot of money on a car I’d rather have some classic boat from the late 60s. Anyways, I’m going to head out in a couple of hours to explore the Plateau. Hopefully I’ll come across something good on this day of moving. Indeed, Ferrari are nice cars, but I’ll take an old beater any day, where I don’t have to worry about every little scratch (or anybody looking to steal it). I read the article about you in The Gazette.It was marvelous.You are finding less valuable stuff in the garbage because maybe there is more competition for scavengers in the Plateau and environs.I know you can not be in many boroughs regularly because of geographical distance,but if you can at least diversify your search area a bit more,maybe it would yield more treasures.More importantly,I think you are teaching some people and some readers to throw out less.You are also inspiring several readers to do their own scavenging.I hope since the articles in The Gazette and Journal de Montréal appeared about you and your blog,your Montreal readership and number of Montreal subscribers has gone up.Local readers an pick up on your hints on where to dumpster dive;readers in Australia,Poland and the US can be inspired,but they cannot actually dumpster dive at any of the spots you mention. For a few years, there was a Classic Boat Show at the Old Port in Late August. They cancelled last summer’s one for some reason, but certainly implied that it would be back. So keep an eye out. It was the sort of thing the Astors would ride around the lake at the summer cottage i. Looks counted as much as transport. Or, the scene in “Indiana Jones and the Last Crusade” where he’s in a wooden motorboat and chased, the Classic Boat Show had that sort of boats on display. Worth a visit, and entry was free. Those wooden basket things on the very top of the pile are the first things I would “pick”!